Nausea and fatigue are common problems, and they affect many women worldwide. These symptoms are typically harmless, and so are many of their causes. However, as nausea and fatigue are common symptoms of many ailments, they can also be indicative of serious underlying conditions, and they can also interrupt daily routine. Read on to discover some of the most common causes of nausea and fatigue. Fatigue is defined as a feeling of persistent exhaustion that sometimes does not disappear even after periods of sleep and rest. Symptoms include heavy eyelids, lack of motivation, irritability, and difficulty concentrating. Fatigue can occur alone or be an indicator of another condition. The top causes are listed below. Anxiety uses a lot of energy and can also cause insomnia. These two consequences can often combine to create chronic fatigue. Anxiety is often then exacerbated by the fatigue and the resulting irrational thought processes, so it is easy for people to fall into a cycle from which they find difficult to emerge. 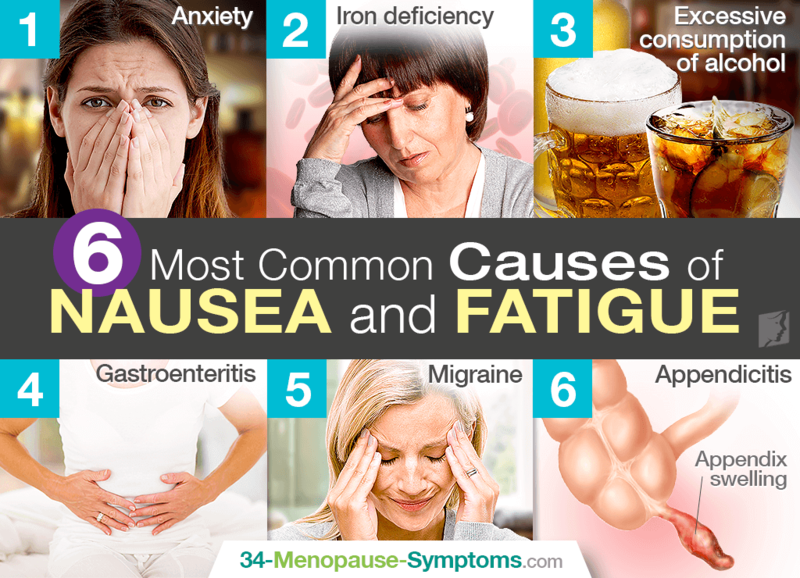 Lack of iron is one of the most common medical causes for fatigue. It causes fatigue because there are not enough red blood cells to transport oxygen around the body in a very efficient manner, owing to the fact that iron is the mineral partly responsible for red blood cell production. A typical indication of iron deficiency is a lack of motivation and heavy muscles. Alcohol is a depressant, so drinking too much of it can lead to low mood and possibly even clinical depression. This in itself can cause fatigue, as the stress resulting from a low mood can use up a lot of energy and affect sleep. Alcohol is also a sedative, so drinking regularly can induce a constant sleepy state, affecting everyday life. A feeling of nausea might or might not result in vomiting, and is often the body's way of reacting to an infection or some foreign substance that it is trying to get rid of. Nausea is often a response to something harmless, but occasionally can be indicative of something more serious, so chronic nausea should always be checked by a medical professional. This is a common condition characterized by inflammation of the stomach and intestines, and most of the time is caused by infection or food poisoning. Gastroenteritis usually clears up after a few days, but can interfere with water and salt absorption in the body, sometimes leading to nausea and vomiting. Migraines are often described as an intense throbbing pain on both sides of the head, and sufferers can experience severe pain. This can lead to a feeling of nausea, augmented by a sensitivity to strong lights and smells. A sudden onset of nausea can sometimes indicate acute appendicitis, which is a medical emergency. It will often also be accompanied by a sharp pain in the abdomen that seems to travel within a few hours. This pain is caused by the appendix swelling, and it must be removed as soon as possible. Nausea and fatigue will often go away on their own and are often nothing to worry about. However, if these symptoms seem to lasting a long time, or are accompanied by any unusual or worrying symptoms, it is important to seek professional medical help immediately in order to rule out any underlying illnesses. Learn more by clicking on the following link focused on the 3 different approaches to handle fatigue. Thyroid Problems and Fatigue: Should I Be Worried? Extreme fatigue is normal after a hysterectomy; keep reading to understand why this occurs and what can be done to combat it.